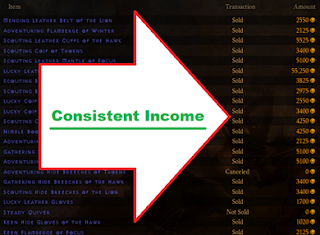 Consistent income is the goal of this post. The name of the game is supplying players with what they want. Namely, gear that helps them improve the statistics they care most about. I originally thought that you needed to just craft and craft until you had the best gear, salvaging anything less than optimum. I was absolutely and totally wrong. Over time, I’ve realized that the majority of players aren’t willing to buy the most expensive gear, simply because they can get by with less than perfect. Sure, when you have a perfect item it sells for a ton of money, but it also takes way too much to create one. How then can we come up with a method for making gold/money through crafting that results in consistent income? For certain items, such as boots, special affixes top the normal “best” ones. Boots have something called +Movement Speed and since it only appears on boots, that’s a big reason why players will buy them. For weapons, the most highly sought after statistic is DPS. Anything with +Damage and +Attack Speed will result in much higher DPS than the base version of the weapon. There are several different ways to get cheap crafting materials. One way is to log on when most players are not playing, such as Saturday mornings, and buy as many underpriced materials as possible. Another method is to bid on items which are selling for less than the normal cost of the crafting materials that they create. 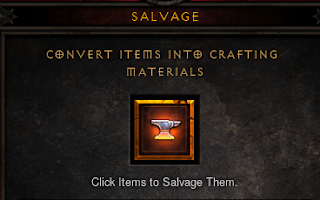 Since it’s easy to figure out what something salvages into in Diablo 3, this is a really easy way to grab tons of cheap materials. Just place as many bids as you can find deals for that are under 24 hours. A third way to get cheap materials is to ask in trade chat. Often, players will be willing to sell their materials for less than the price of the auction house, so long as it isn’t more than a 15% decrease. Why? Because that way they avoid the 15% fee for the auction house. They get more money and you get a cheaper product. So what salvages into what crafting materials? Magic items salvage into dust (blue). Rare items salvage into rare materials (yellow). Legendary items salvage into legendary materials (orange). Each "tier" of item has a small chance to salvage not only into a corresponding crafting material but also one tier higher. So you have a small chance to salvage a magic item and end up with both a blue and yellow crafting material. Each act has its own blue, yellow, and orange tier crafting materials. Instead of crafting one item over and over again until you get a perfect version, craft one or two of each item type. Don’t just craft the items with the most affixes, or the ones with special affixes like boots (+movement speed). Basically, do your best to create a motley selection of items. If you end up with 20 different item types for your 20 auction slots (10 on each auction house) then you did a great job. Craft a handful of each type. If you want, you can craft one of each, but I would suggest two to three in one sitting. Step 3: To Sell Or To Salvage? The hardest part of selling crafted items is figuring out what to throw away. Let me use general terms that can apply to all items. Take the maximum stats for an item. If you get maximum for any one stat then the item is definitely a keeper. If you get a combination of one max stat plus any other valuable stat then it is a really good item. If it’s perfect in more than one stat then it will sell for tons. If all of the stats on the item are below 50% of the perfect version, then I would salvage it. If you have at least one stat above 50% then keep it and eventually try to sell it. Remember, you’re going for a diverse group of items, so don’t sell more than one unless you have multiple “perfect”s. It’s better to sell a boots with 75% stats, gloves with 75% stats, and belt with 75% stats then it is to sell three belts with 80% stats. Diversifying makes a huge difference on how many auctions you end up selling. How do you tell the max affixes for an item? Simply go to Diablonut and look for your item. Then scroll down and click on the affixes tab like this one below. Look up comparable items to determine your price. Get a feel for the competition. If there’s tons of items then undercut the lowest one and just get your money as quickly as possible. If there’s very few with similar stats then decide if you don’t mind waiting for the others to sell by pricing yours higher. For perfect items, the sky is literally the limit. Price at 5 times any non-perfects of the same item. If you don’t have the time to figure out a price for your items (let’s face it, some of us can’t afford the 2-3 minutes per item), then just use 10x the crafting cost as a rough estimate for non perfects and 50x for perfects. I would HIGHLY suggest looking up the price if you find a perfect. As a new auctioneer, your best bet is to take the time to learn the value of items and put the time in. If you can’t do this for all your items, try to do it for one or two each time you post. This will help reduce the number of items you don’t sell. When someone searches on the auction house, they tend to search for one criteria at a time. So if they want movement speed, and your rare boots have the maximum amount, they will have more armor than similar magic items and therefore appear at the top of the list for that user's search. When people sell their items, they sometimes forget that they don't have to compete against all perfect stats at once. Like a pair of boots with max movement speed, max gold find, max magic find, etc. If a person only cares about movement speed, then they will buy your less expensive "almost perfect" pair simply because that's the only stat they are looking for. If someone searches for movement speed, your pair will come up second. Despite the fact that your boots are vastly inferior, the buyer will choose you because they only care about movement speed. 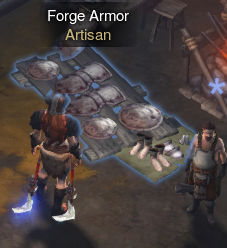 Due to this fact, you could probably sell your boots for much more, such as 150,000 gold. Once you get into a rhythm of buying materials, crafting, and selling, you will inevitably end up with more items than you are capable of selling. Don’t salvage these though! You never know when a drought of materials will happen and you’ll need to rely on these items to make money. Store everything you can, and organize it according to perfect and lesser degrees of perfect affix roles. I’ll let you come up with your own method of storing, but basically you want to create a bunch of extra characters who all have names that identify their role. You could create a Wizard called “Wizard” or “Wizloot” that keeps all of your Intellect and Wizard specific items. Basically, come up with a reasonable method for storing your items on extra characters (affectionately known in the community as mules). Using mules, you really don’t need more than an entire storage tab on the shared stash. That way you can quickly move items from your main to your mules. You really only have to do this once, since you can sell from any character’s inventory when posting auctions.